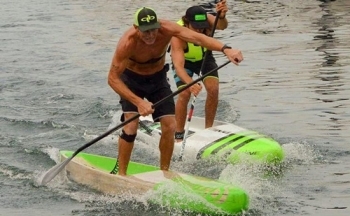 ONE SUP has just announced the signing of top paddle athlete Jake Jensen, a major pick up for a boutique brand that’s aiming to punch above its weight and give the powerhouse brands some stiff competition. Check out this great little clip of ONE SUP founder Paul ‘Jacko’ Jackson and head designer (and highly under-rated paddle athlete) Ben Tardrew playing in the bumps off the Gold Coast today on the new 17’7″ ONE unlimiteds that have just landed in Australia and are now available to buy (edit: sold out but available for back-order). 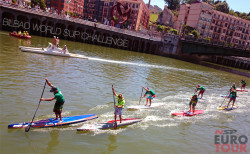 We’ve just wrapped up the largest SUP race ever held in Australia. 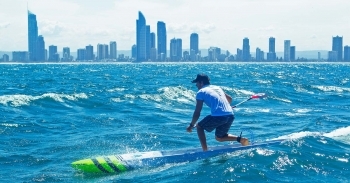 The Forster Island Paddle Festival attracted hundreds of stand up paddlers for a weekend of sprint, surf and flat water racing. Paul & Angie Jackson Depart Fanatic – Where To Next? Aussie globetrotters Paul and Angela Jackson have officially departed long-time sponsor Fanatic. In case you were wondering what we’re in for at the Battle of the Paddle tomorrow, here’s a good preview of Salt Creek’s current surf conditions… Many of the world’s best were down there this morning, putting in some last-minute, hail-mary training at the new home of the BOP and trying to figure out how to fit 12 and a half feet of carbon down a steep wave face. Mo Freitas has taken out the Shonan Chigasaki Pro in Japan ahead of Aussie trio Paul Jackson, Toby Cracknell and Beau O’Brian. 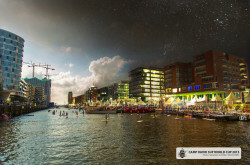 Chase Kosterlitz rounded out the top five while Bart de Zwart finished sixth. Despite a relatively small field in the women’s event, Angie Jackson continued to show her strength with a very dominant display. 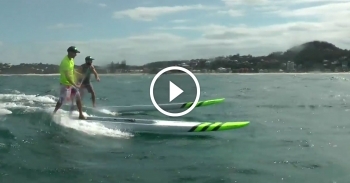 Apparently it’s the week for awesome SUP videos… After the epic downwinder in South Africa we posted a couple of days ago, here’s another insta-classic clip. 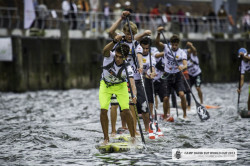 This video really has nothing to do with SUP racing (apart from featuring a couple of famous paddlers) but I don’t care, it’s awesome and everyone should see it. 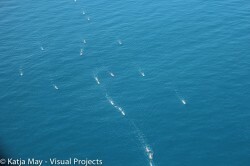 If this doesn’t get you stoked to go paddling I’m not sure what will. Cool little clip from the Fanatic boys, Paul Jackson and Jake Jensen, from a downwinder they scored at home on the Gold Coast this week. While the Gold Coast scene is known for producing BOP racing masters, the region actually gets some pretty awesome downwind conditions on a regular basis. 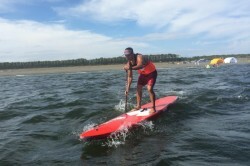 Boss Man’s note: Paul Jackson is one of the fastest guys on the water and follows the SUP racing scene more closely than just about anyone else. He’s also got some pretty strong opinions. A lot of them. You may not always agree with what Jacko has to say, but at least he’s not afraid to say it. And that’s something I think we need more of in a sport that can be too politically correct for its own good sometimes. 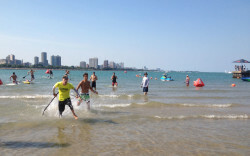 Connor Baxter has taken out the Chicago World Paddle Challenge, claiming both the sprints and distance events to keep his 2013 Stand Up World Series unbeaten streak alive. 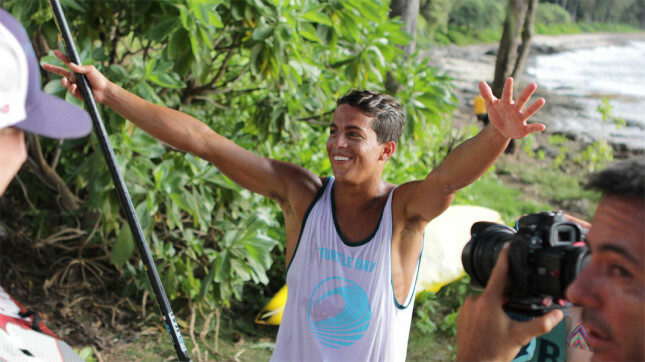 Kai Lenny was 2nd in both races, while Zane Schweitzer and Jake Jensen finished equal third overall and were forced into a tie-breaker sprint-off. Meanwhile in the women’s event it was all Annabel Anderson, with the Kiwi claiming the double victory ahead of Aussie Angie Jackson.